I love helping early stage entrepreneurs as I’m an educator at heart. I’ve started several companies and like being able to share my experience to help other entrepreneurs. I think there are way easier ways to make money so if that’s your only goal, you should not be angel investing. It was a movie and something I felt very emotionally tied to. It raised the profile of mental illness in the Asian American community and was a Sundance finalist. When I heard about it, I said, “This is a movie that more people have to see.” Even if I lose all of my money on this one, I’m still glad I invested. One that’s doing very well is Legends of Fighting. It’s like Ultimate Fighting Championships (UFC), but in Hong Kong. They just raised a $4M Series A on a $13M valuation. They are on TV, selling broadcast rights. I know nothing about the space, but my husband and I went to school with the two co-founders, and they are both really smart guys and one knows the MMA space very well. What’s your biggest lesson learned? I relied on other investors too much at the beginning. I would think, “This person seems smart” so I trusted their due diligence probably more than I should have. I have gotten pretty far down the process and have been within days of writing a check and something didn’t feel right in my gut but I kept saying, “But this guy is invested in it and he must know what he’s doing.” To be clear, it is less about those people not being smart and more about my needing to get my feet grounded as an investor before I understood what my investment style was. People often say that there are three types of investors. You either invest in the team, the market, or the technology. I am a team investor, I care about the team first and foremost most so it doesn’t make sense for me to rely solely on someone who cares first and foremost about the market they are playing in. That’s what my gut was telling me. For instance, I heard great company pitch yesterday and several people whose opinion I trust are interested. And even though I think the company will make a lot of money, I didn’t feel a connection with the team so I won’t be pursuing it. What’s the smartest thing someone pitching you (or who you invested in) said / did? The entrepreneurs that I like most are the ones that I say “no” to and they a) ask for feedback and b) three months later email me to show how they responded to the feedback. They stayed on my radar because they realized that this is not in any way, shape, or form a short term transaction. Maybe I missed their friends and family round; maybe I said no to their seed round, but guess what? Maybe I can introduce them to a Series A investor. That’s smart. This is a long term game. “American Idol” reactions. You know, the “I’m gonna be a huge star one day and you’ll be sorry” type responses. You run 37 Angels, a community of women angel investors. What’s the difference between men and women angels? In general, I think women feel the need for a higher level of confidence before trying something new. They feel they need to know more about something before jumping in and their appetites for ambiguity can be low. This makes them less likely to go into angel investing and it’s why women angels have something of a reputation for taking a long time to pull the trigger. At 37 Angels I try to a) increase this appetite for ambiguity, and b) help them do more effective due diligence, to get it down to five weeks instead of 5 months. We show them that there are different levels of due diligence, what to do, what not to do, etc. How will you know when 37 Angels has succeeded in its mission? When what people remember about me is not that I am a woman angel investor but rather that I am a healthcare tech investor who has deep expertise in the pharma industry. I’ll know I’ve succeeded when I walk into a room and people don’t automatically introduce me to the other woman in the room. Seamless, real-time health monitoring for preventative medicine. Please go to the Entrepreneurs section of 37angels.com. You can also check out my Linkedin profile: @37angelsny. Note: Angel Profiles is a bi-weekly column appearing on AlleyWatch. John’s profile went up a few weeks ago but I haven’t had a chance to post it here until now. Here’s the original article. I came out of AT&T Bell Labs, doing bleeding edge technology for 10 years, and then marketing and business management of large telecommunications projects sold overseas. So when I left, this was a natural extension of what I was doing AT&T. I made money in the stock market and apply the same discipline to angel investing: sell the losers and double down on the winners. Getting out of an investment is very difficult for most angels when the company is no longer viable as opposed to putting more money into it. I also play poker and most angels and entrepreneurs are good poker players. It’s either Xlibris or TuckerToys, I can’t remember. Xlibris, the first self publisher on the internet, sold about three years ago at a very nice profit. TuckerToys makes the Phlatball – over 15M sold, mostly overseas. TuckerToys produced a couple of great years of dividends and is still in existence. What investment do you most want to brag about & why? The two companies I am most famous for are Diapers.com and Bikini.com. People used to make fun of me for investing in Diapers.com because we were selling diapers on the internet… until Amazon bought it for $545M. And the really neat part was that I contributed absolutely zero to it, other than money and encouragement. It was like watching a really good movie. Marc and Vinit were super operational people and did not need any advice. I like to mention Bikini.com because that humanizes me as an angel investor as opposed to those money hungry number crunching VCs. I need to have some fun too! I’m proud of some of my train wrecks because I learned things from them. For example, MakeUsAnOffer was doing exceptionally well and then we got into some legal patent issues. We were probably in the right but couldn’t survive the lawsuit. Some things can’t be anticipated or planned for and you just don’t have the resources to handle. Tell me about the startups that got away? Never had one that got away. The closest I came to this was a company I wanted where a big VC did not want any other outside investors to get in. Ultimately, I got in indirectly through a VC fund where I am a limited partner. In most cases, the startups are just starving for cash; it’s almost always never the issue that it is so oversubscribed that you cannot get in. Coming from Bell Labs, I assumed I could make anybody a good manager. But you can’t. At best you can influence them four or five degrees. You simply can’t make someone a good manager. That was my first humbling experience. What impresses you about an entrepreneur? I like someone who is clear, concise, compelling and elegant. I like to see an executive summary that fits on a single page with a lot of white space. And I love an idea that I have never seen before. Most ideas are retreads or rehashes. Hotlist especially made an impression. They had amassed a massive database on events that people had gone to, were going to, or would be going to and there is a lot of location based services one can offer having that information. I had researched this area by doing due diligence on a few companies. Hotlist just had everything buttoned down and I made my decision in 28 minutes. What turns you off to an entrepreneur? Whenever people use the word “conservative” or “next generation.” I have a secret dictionary of these words which earn demerits and can disqualify the entrepreneur. This is how I “gamify” my investment process. What makes you different from the average angel? I like to invest in only industries that I know nothing about and I generally “let the dogs run.” I offer light overall guidance and try to introduce them to people who can help them. I am not an invasive investor. Also, I mentor a lot. I have mentored companies which I did not invest in because they didn’t need the capital. I do it pro bono, because most entrepreneurs are nice people and in return I learn from the experience. I currently mentor 10 to 15 companies like this. They call me every four to six months for some advice or guidance and it’s usually a 15 to 20 minute session so it’s not a real time burner. Recently, I’ve begun to mentor a number of international companies through Springboard and the Worldwide Investor Network. I also mentor women entrepreneurs through Astia & Springboard as well as women angel investors within Pipeline Fellowship, Topstone Angels, and 37angels. I have funded 11 female-founded companies, five of women were foreign born. I aim for 10x returns. I say I want it within 3-5 years… although that’s never been achieved. 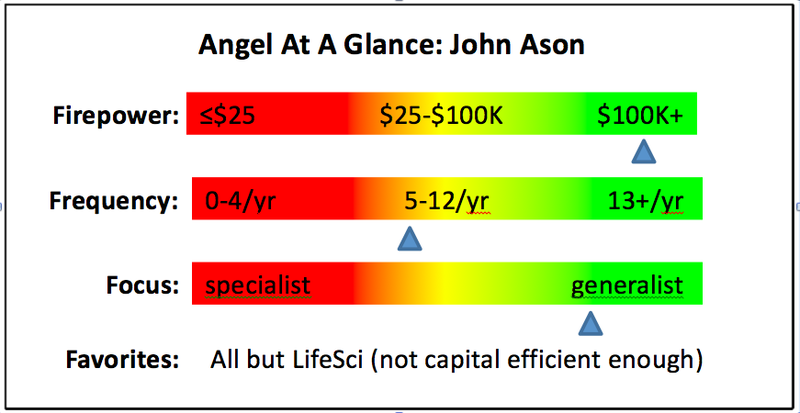 You have been angel investing for 17 years. How has it changed since you first started? There has been a dramatic change over the past two or three years. 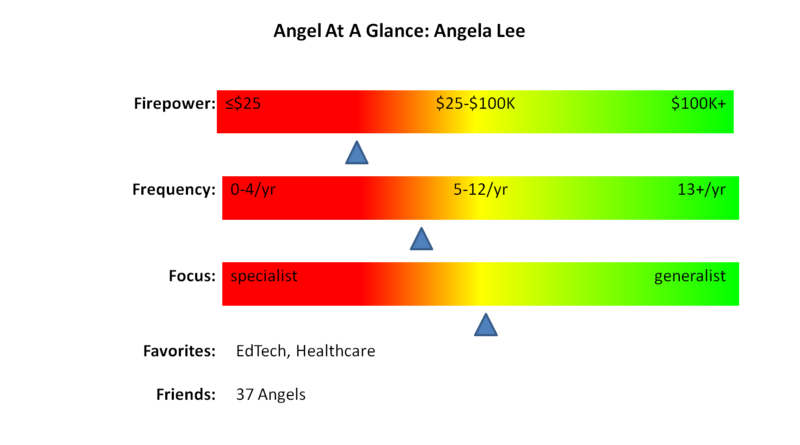 The costs of starting a company are close to zero. The cost of proving the market with landing pages – sign up for the beta, sign up for a newsletter, answer a survey, stuff like that – is also close to zero. You can prove that there is a market without having a product. AngelList. I used to do 1 to 2 deals a year, very painfully. Finding a company was a big problem. Now AngelList has close to 19,000 startups on it so finding startups is not an issue. So is finding investors. In the past I used to syndicate deals. In my first 10 years, I knew everyone who invested with me intimately. Now, I tell my founders to list the company on AngelList with me as an investor and they assemble the rest of the syndicate. The majority of the other investors in my current deals are people I have never met. Accelerators like ERA, DreamIt and TechStars are producing large numbers of high quality, fundable companies. Super angels and micro VCs like John Frankel’s ff Ventures have a lot of cash for angel level companies, assisting in the fundraising process in a very positive way. Deal size. The average round until about a few years ago was $250K-$275K. It is now close to $650K. Many of these companies will skip their A round. International. The biggest response to my website comes from overseas asking me how they can invest in my companies and be angels in general. I received four investments into my companies. I have also received interest from foreign government organizations and universities on how to foster startup and angel ecosystems. We are also seeing a large number of foreign companies seeking funding. Brainwave chips. There are several startups that let you control your computers with brainwaves and they are starting to get a little bit of traction. They have various devices that go over your head and with this one can control a device that provides input to a computer. As this industry matures miniaturization will occur that will lead to a brain chip. Will they really implant these chips in their heads? Why not? I have a defibrillator. I don’t want to carry one around so I had it implanted. They could put it on sunglasses, but fashion will win out and they will ultimately be implants. Email me at ason@comcast.net but read my website first! Also, check me out on AngelList, Linkedin, Twitter, Pinterest, Spling, Tip or Skip, & PRESSi.